Pirates have captured the world’s imaginations from Peter Pan to Pirates of the Caribbean. If you love those fictional swashbuckling tales, you’ll be amazed at the legends and stories of the real pirates that stalked the seas. There is no better place to immerse yourself in pirate history than the St. Augustine Pirate & Treasure Museum. After five successful years in Key West, Pat Croce moved the Pirate & Treasure Museum to the pirate stronghold of St. Augustine, Florida where pirates Sir Francis Drake and Robert Searles are said to have frequented the nation’s oldest city and the Spanish fortress Castillo de San Marcos. The museum displays one of the only authentic Jolly Roger flags in the world as well as a 400 year old treasure chest that guests can actually touch. Have you ever wondered what it feels like to lift a bar of gold in your hands? You can do it at the St. Augustine Pirate & Treasure Museum. A display allows you to lift an actual gold bar housed in a see-through display case. Do you enjoy scavenger hunts? Every guest at the St. Augustine Pirate & Treasure Museum receives a map. Guests are invited to search through Discovery Drawers marked with a skull and crossbones hidden throughout the museum. Find the hidden drawer and collect a stamp for your map. Can you find them all? You can even touch a torch to a fuse and fire a cannon from a ship! If you like swords, firearms and treasure, the St. Augustine Pirate & Treasure Museum is filled with them. These aren’t props. They are authentic pirate collections. One of the most creative and spooky displays is the audio chamber. Guests enter a dimly lit room, put on headphones and experience an audio drama recreating what it would have been like to be below deck when Blackbeard’s ship was finally captured. You hear and feel the cannonballs hit the ship. You hear the sounds of men battling for their lives with swords. Finally, you hear Blackbeard’s last battle as he is hit by five gunshots, twenty sword cuts and then beheaded. Once you are back in the museum, Blackbeard’s head hangs there to greet you. Through the magic of robotics, the head tells guests tales from Blackbeard’s life and death. The latest addition to the museum is a permanent exhibition featuring artifacts of the Red Sea Pirates: buccaneers who traveled the West Indies around Africa into the Red Sea from the early 1690’s to 1700. These Pirate Round pirates included captains Henry Every and William Kidd. Featured in the exhibit are a 17th century Khanjarli Dagger and an 18th century trade sword as well as porcelain and pottery discovered on a Red Sea shipwreck by noted archivist Dr. John De Bry, director of the non-profit Center for Historical Archaeology in Melbourne, Florida. If you want to immerse yourself in pirate history, there is no better place than the St. Augustine Pirate & Treasure Museum. 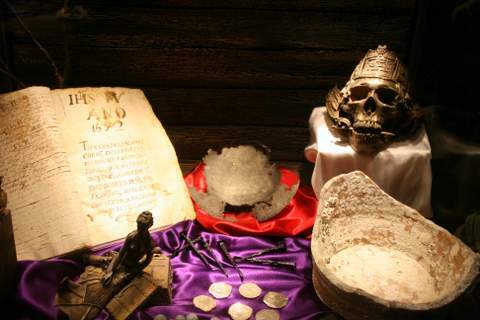 The St. Augustine Pirate & Treasure Museum is located at 12 S. Castillo Dr., St. Augustine, FL 32084.